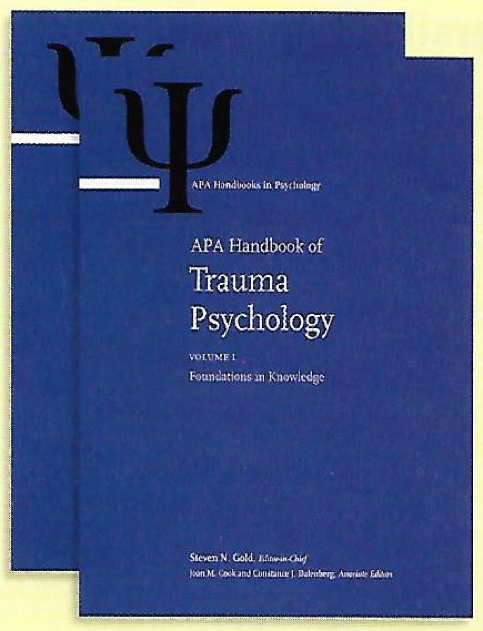 On behalf of Associate Editors Constance Dalenberg and Joan Cook, and Editorial Assistant Amy Ellis and myself, I am very excited to announce the publication of the APA Handbook of Trauma Psychology. The Handbook was a vast undertaking; a little over three years after the project was initiated it is staggering to see the scope of the work in its final form. The finished product consists of two volumes and a total of 57 chapters authored by over 100 nationally and internationally recognized experts in various specialty areas of trauma psychology. Volume 1, Foundations in Knowledge, surveys the empirical and theoretical literature in the field. The content addressed in that volume spans wide-ranging territory: defining trauma; methodological and statistical considerations in studying trauma; various major types of traumatic events and their impact; the range of symptom patterns commonly associated with trauma; conceptual approaches to understanding traumatization; and trauma as viewed from the frameworks of various disciplines such as law, philosophy, ethics and religion. In Volume 2, Trauma Practice, practical applications of traumatology, including various forms of assessment, a broad array of treatment approaches, and treatment modalities such as family therapy, group therapy, trauma-informed care, and systemic/organizational perspectives are presented. The extensive coverage across chapters and division of the material into specific subjects positions the Handbook as an accessible primer on trauma psychology for undergraduate students, a resource work for practitioners, and a valuable reference for researchers. The two volume Handbook sells for a list price of $395.00, but is currently available to APA members and affiliate members at a markedly reduced rate of $195.00 for both volumes. To render the Handbook readily adaptable as an educational tool, individual chapters can be accessed digitally. Those at institutions that have purchased the electronic version of the Handbook will be able to read individual chapters online via the APA PsycNET platform. Others will be able to purchase access to individual chapters via APA PsycNET Direct (http://www.apa.org/pubs/databases/access/direct.aspx) at a cost of $11.95 each. This allows instructors to assign those chapters most relevant to the content of their courses content at an affordable price. Although the release date of the Handbook was in April, 2017, Drs. Cook, Dalenberg, Ellis and I have been gratified to have already received enthusiastic feedback from readers. We believe that this project, which has been branded “the most comprehensive guide and reference work on the subject to date,” is poised to function as a powerful tool to help disseminate awareness of our field to other psychologists, mental health practitioners in general, allied professionals, and researchers. In support of this effort, we encourage members of Division 56 to post reviews of the Handbook on amazon.com and elsewhere. We also welcome receiving your comments and feedback directly via email.